Correspondence between “M” and “Q” from the National Intelligence Archives on Declassification Day. 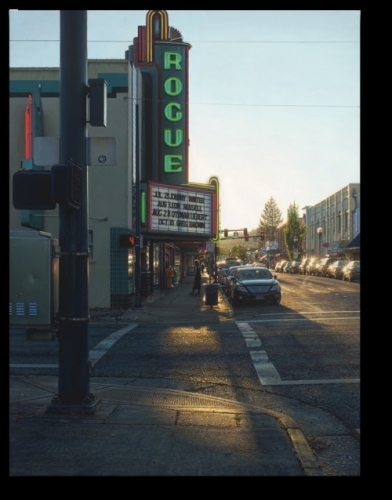 M: It appears that, in recent years, Davis Cone has considerably advanced the genre of Photorealist painting. Q: Indeed, Cone has achieved a greater sense of depth in the works he’s been producing over the past ten years. He doesn’t emphasize the inherent flatness of photographs, as other Photorealists have done. M: Instead, Cone’s works from 2008 through today seem to counterpoint some of the rich and colorfully printed photographs that have been ascendant in art gallery and museum exhibitions since the mid-1990’s. Q: Are you referring to the works of Philip-Lorca diCorcia, Gregory Crewdson, and Andreas Gursky? M: Yes. And also those by William Eggleston, who’s been on the scene since the late 1960’s. Q: Of course, Cone’s work has a physical presence that actual photographs don’t have. M: That’s true, but, what Cone is doing is a New Photorealism, as he is more fully dimensionalizing his subject matter. Q: Kind of like what Bob Dylan had done when he had gone “electric” at the Newport Folk Festival in 1965. Q: It’s just that his gradual development as an artist from one set of paintings to the next has concealed how his work has evolved. Cone can now be more readily recognized as an atmospheric painter. His work has never been about merely documenting motion picture house façades. M: Indeed, in Cone’s “Rogue” and “El Rey,” shafts of sunlight pour through the streets that front each of these cinemas. They don’t appear as lens flares. Q: Likewise, in “Kiggins/Marquee Scrabble,” the sun’s light appears to be bending around the upper reaches of the building. Here, Cone celebrates the construction and the form of the Art Deco design of this particular movie house, as well as the sunlight that envelops it. The result is poetic and convincing. 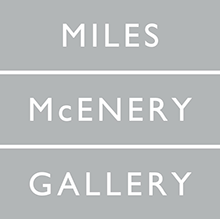 M: And, as Cone increasingly depicts spaces that are more open, inviting, and natural, his affinity for the Hudson River School becomes more apparent. Q: In “Grandview,” the warmth of the late afternoon sunlight on the fully-leafed trees reveals the beauty of early autumn, as the orange-brown foliage co-exists with the green foliage. In “Lark/Double Portrait: Bay Light,” Cone depicts a summer scene, as the foliage is in a wide variety of greens. M: In both works, the trees are in the distance, past what is probably the central business district of each of the communities that are depicted. Q: In “Grandview,” most of the trees line both sides of a central street in an area that is probably residential. In “Lark/Double Portrait: Bay Light,” the trees at the end of the road are closer together; they mark the start of a forested area, which rises onto hills that are further in the background. M: The placement of the downtown areas in the foreground and the arboreal areas in the background calls to mind the paintings of Thomas Cole, who depicted the distinctions between the domesticated or civilized world and the natural world. Q: Interestingly, Cole showed the two concurrently side-by-side in “View from Mount Holyoke, Northampton, Massachusetts, After a Thunderstorm” (a.k.a., “The Oxbow”) and, temporally, one replacing the other in the series, “The Course Of Empire,” while enabling the viewer to take in both worlds from the same central vantage point. M: Cone, however, situates the central business district in the foreground in both “Grandview” and “Lark/Double Portrait: Bay Light,” and separates the viewer from the more natural settings, which are in the background. Q: Since Cone is primarily concerned with compositional dynamics, his motives for doing this are likely to have little or nothing to do with any attitudes he has about Romanticism. M: The movement of energy through the planes of his paintings appears to be of critical importance to Cone. In this way, he is like Brigid Riley, who has often addressed how speed is manifested within paintings. Q: Two of Cone’s earlier works reflect the significance of this concern to him. "Criterion" is about mobility, and “Metro” is about immobility. M: The motor vehicles and pedestrians moving rapidly through the Times Square area at nighttime in “Criterion” and the vehicles parked or at a standstill in the snow on a tranquil stretch of Broadway in a residential area of New York’s Upper West Side on a sunny afternoon in “Metro” represent a study in contrasts. Q: Within a singular composition, such as, “Normal Theater,” Cone depicts the commingling of artificial light and natural light. Q: Although “Normal Theater” is not a noir painting, Cone succeeds in showing the gradual takeover of the night here, reinforcing this with the presence of pedestrians who appear to be moving slowly in front of the theater. M: In these times, who can measure such a triangulation except a skillful, visionary painter? Q: There is research and development being done on artificial intelligence with a view towards enabling technologists to mimic natural intelligence. M: Cone, however, is not concerned with predictive modeling. Q: As a drummer in a jazz combo during his formative years, Cone knows about improvisation and syncopation. M: Cone is not concerned with idealism. He allows for the idiosyncrasies that can be found in his source materials. Q: Working with photographic transparencies, through which light is transmitted, he applies paint to surfaces, upon which light is reflected. M: The process itself is counter-intuitive. Q: However, it does not yield an anti-logical solution. M: It’s not a solution to anything at all. Q: Cone’s work is an expression of his unique way of being. Kinerk, Michael D., and Dennis W. Wilhelm. "Popcorn Palaces: The Art Deco Movie Theatre Paintings of Davis Cone.“ New York : Harry N. Abrams, 2001.